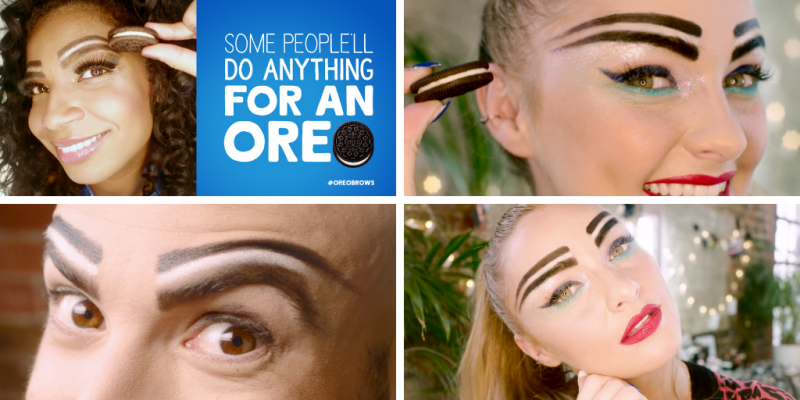 Oreo has enlisted influencers to help them prove that ‘Some People’ll Do Anything For An Oreo’ in a multifaceted creative campaign. One of the challenges is urging people to ‘Oreo’ their brows by drawing black and white lines above their eyebrows, creating a stylish ‘Oreo-like’ effect. Oreo fans are encouraged to upload pictures of their efforts and tag #Oreobrows on Instagram. The grand prize is simply a single pack of Oreos. Nevertheless, the bizarre stunt has gained a lot of media coverage and social media buzz. Another aspect of the campaign is Oreo’s partnership with YouTubers ‘The Slow Mo Guys’ who have a following of 11m. The video they created with Oreo has over 1 million views.